Police Raid In Philippines Kills Mayor Who Duterte Had Named As Drug Suspect : The Two-Way The mayor of Ozamiz, his wife, and more than a dozen others were left dead after a late-night police raid turned into a firefight. The local police chief said the mayor was a "high-value target." 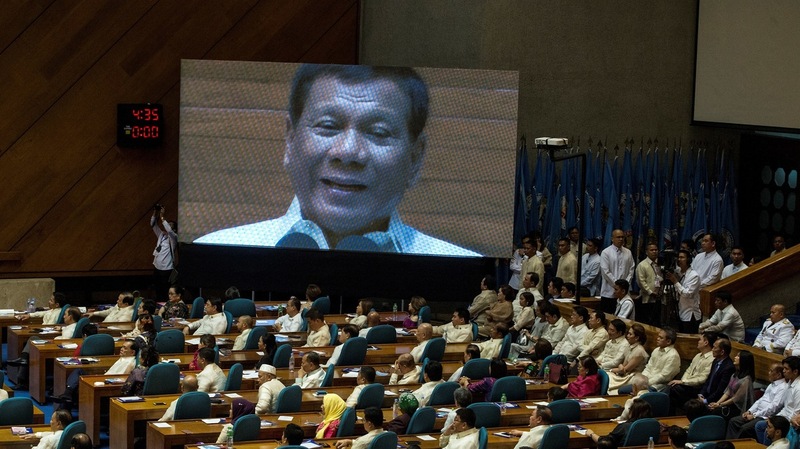 Philippine President Rodrigo Duterte is seen on a large screen as he delivers his state of the nation address at Congress in Manila on July 24. Duterte vowed to press on with his controversial drug war that has claimed thousands of lives, as he outlined his vision of an "eye-for-an-eye" justice system. On Sunday, a police raid killed a mayor Duterte previously identified as a drug suspect. A late-night raid in the southern Philippines left 15 people dead, including the mayor of Ozamiz City — the latest high-profile casualty of the Philippine President Rodrigo Duterte's bloody war on drugs. President Rodrigo Duterte is waging a bloody war on drugs in the Philippines. Last year, Duterte published a list of more than 150 government officials he accused of having ties to the drug trade. Ozamiz Mayor Reynaldo Parojinog Sr., and his daughter, Vice Mayor Nova Echaves, were on that list. Now Parojinog and his wife are dead, and Echaves is under arrest. Police raided the mayor's house overnight to search for unlicensed guns. The ensuing firefight between officers and bodyguards killed more than a dozen people, including Parojinog and his wife. Ozamiz police chief Jovie Espenido described Parojinog as a "high-value target on illegal drugs" and said that police seized assault rifles, cash and suspected drugs during the raid, The Associated Press reports. Timoteo Pacleb, the chief of police for northern Mindanao, the island where Ozamiz is located, told reporters that police that gunfire from the residence led police to "retaliate," Reuters reports. When he was running for president, Duterte vowed to relentlessly crack down on the drug trade in the Philippines, telling voters "forget the law on human rights" and warning drug pushers and "do-nothings" he would not hesitate to kill them. He handily defeated four rival candidates. Since taking office, Duterte has stood by his promise. Thousands of people have died in the streets — shot by police, or killed under unknown circumstances, apparently by vigilantes. The campaign has been strongly condemned by much of the international community, and numerous human rights groups. But as Michael Sullivan reported for NPR last month, "Duterte is actually more popular now than when he was elected." "I don't even consider them extrajudicial killings," one student in the Philippines told Sullivan. "For me, if you're a drug user, a drug seller, you're a sickness in society. You need to disappear." But some are certainly concerned by the killings, particularly families of victims. In November, one woman told Sullivan her son was shot by police because he was a witness to a street execution. "It's useless to protest to police, because they invent stories," she said. "So we did not try to complain." As police chase alleged users and sellers on the streets, Duterte has denounced people within the government who he accuses of profiting off the drug trade and hampering his efforts to crack down on drug traffic. For instance, Senator Leila de Lima — a former head of the Philippines Commission on Human Rights and an outspoken critic of extrajudicial killings — is currently in jail. Duterte accused her of taking money from jailed drug lords. De Lima denies the charges, describing them as retaliation from Duterte after she launched an investigation into police tactics in the war on drugs. Then there's that list. Or rather, the lists. Duterte claims to have a private list of up to a million people suspected of involvement in the drug trade, including thousands of police officers and local leaders. Then, of course, there are the scores of names he has published. A spokesman for Duterte said in a statement that "the Parojinogs, if you would recall, are included in President Duterte's list of personalities involved in the illegal drug trade," Reuters writes. "Duterte has vowed to defend policemen who would face criminal and human rights charges while cracking down on illegal drugs. He recently ordered a police officer charged in connection with Espinosa's death to be reinstated after briefly being charged and suspended following the jail killing."